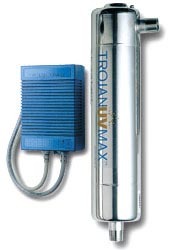 Trojan UV Max Ultraviolet (UV) Lamps disinfect water for residential and commercial applications. These lamps create light at 254 NM wavelength, this wavelength kills all bacteria, viruses, molds, algae, and yeast in your water supply. The UV system installs on the inlet pipe to your house killing bacteria and viruses from your incoming water line. A UV lamp purifier should be installed in every home to provide safe drinking water. A must for rural homes or cities where water quality is questionable. ****The UV Max Pro 7 and UV Max Pro 15 are replaced in 2008 with the new UV Max Pro 10, 20, 30 Units below. Bulbs and parts are always available. 30 Lpm 120 V 60Hz/23W -3/4" as above but with higher flow rate. lamp will last 1 - year For medium to larger size homes. Model comes with a remote alarm module which can be mounted away from the unit. For medium to larger size homes. 120 volt. 14 Gallons Per Minute. Model comes with a remote alarm module which can be mounted away from the unit. Also, you can use a Solenoid Brass safety shut off accessory to prevent water flow if your power is turned off. For medium to larger size homes. 120 volt. 14 Gallons Per Minute. *Elapsed time meter tells the user how long the lamp has been in service. Audio and visual alarms tell the customer if there is a problem with the operation of the unit. A Service reminder lets the user know when the lamp needs to be changed. Model comes with a remote alarm module which can be mounted away from the unit. Also, you can use a Solenoid Brass safety shut off accessory to prevent water flow if your power is turned off. For medium to larger size homes. 120 volt. 28 Gallons Per Minute. Model comes with a remote alarm module which can be mounted away from the unit. Also, you can use a Solenoid Brass safety shut off accessory to prevent water flow if your power is turned off. For medium to larger size homes. 120 volt. 47 Gallons Per Minute. Model comes with a remote alarm module which can be mounted away from the unit. Also, you can use a Solenoid Brass safety shut off accessory to prevent water flow if your power is turned off. For medium to larger size homes. 120 volt. 10 Gallons Per Minute. Model comes with a remote alarm module which can be mounted away from the unit. Also, you can use a Solenoid Brass safety shut off accessory to prevent water flow if your power is turned off. For larger size homes. 120 volt. 20 Gallons Per Minute. Model comes with a remote alarm module which can be mounted away from the unit. Also, you can use a Solenoid Brass safety shut off accessory to prevent water flow if your power is turned off. For larger size homes. 120 volt. 30 Gallons Per Minute. Lamp will last 2 years. 1. CAN BACTERIA AND VIRUSES IN WATER CAUSE DISEASES? YES! People can get very sick. Children and elderly people are the most susceptible to illness from bacteria and viruses. In extreme cases people can die from the effects of diseases caused by bacteria and viruses found in contaminated water sources. 2. HOW CAN WE DETERMINE IF THERE ARE BACTERIA AND VIRUSES IN OUR WATER? Samples can be taken to your local health department for testing. Frequent gastrointestinal illness may indicate water contamination. 3. HOW EFFECTIVE IS ULTRAVIOLET DISINFECTION AGAINST VIRUSES? Ultraviolet disinfection is more effective against viruses than other disinfectants. Chemical processes require a very high dose to destroy viruses. 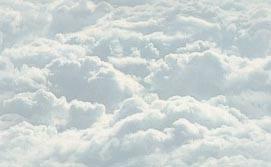 The same ultraviolet dose used to kill bacteria will also kill viruses. 4. CAN TESTING BE DONE ON AN ULTRAVIOLET SYSTEM TO DETERMINE EFFECTIVENESS? The best way to determine effectiveness is to measure UV dose. ALPHA has performed in-house tests on UV MAX systems and similar competitive products using the National Sanitation Foundation "Standard 55" test protocol. UV MAX products subjected to this test protocol outperformed competitive products tested. 5. WHAT ARE THE ADDITIONAL BENEFITS OF UV DISINFECTION OVER CHEMICAL METHODS (chlorine)? Chlorine changes the taste and odor of the water and can form chlorinated by-products such as Trihalomethanes (THM's) which have been linked to cancer. Unlike chlorine, UV disinfection is a natural, non-chemical process. 6. IS A RESIDUAL REQUIRED AFTER UV DISINFECTION? NO. The ultraviolet disinfection process takes place at the moment the water is being used, therefore the requirement for a residual disinfectant is eliminated. 7. ARE THERE LIMITATIONS TO AN ULTRAVIOLET SYSTEM? If the water passing through the reactor chamber contains iron, humic acids, tannins, proper disinfection may not occur because these substances will absorb UV energy. If the water contains a high level of hardness and/or iron, frequent cleaning of the quartz sleeve may be necessary. All of the above circumstances can be corrected with pretreatment systems. Softeners, filters, and other pretreatment devices improve the disinfecting capability of an ultraviolet system. Any pretreatment devices installed as part of your system should be installed ahead of the UV MAX system. 8. 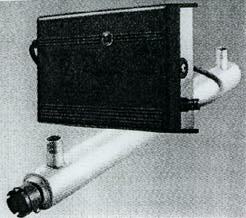 SOME UV SYSTEMS INCORPORATE LAMPS AND QUARTZ SLEEVES. WHY? For optimum UV energy the UV lamp must operate at 104* F (40*C). Quartz sleeves minimize the effects of cold water on UV output. Systems without quartz sleeves can lose up to 85% of their disinfection capability. 9. HOW CAN I BE SURE THAT MY UV SYSTEM IS PROVIDING ADEQUATE DISINFECTION? The determination of adequate disinfection can be done in two ways. One method is to have the health department test a sample of your water to determine if disinfection has been successful. The second is the AQUA UV PLUS model incorporates an ultraviolet monitor. The monitor measures the amount of UV energy in the water chamber and sounds an alarm if the ultraviolet energy falls below acceptable disinfection levels. 10. WHAT IS A UV MONITOR? A UV monitor is a device which detects only the specific UV energy required to kill bacteria and viruses. UV light is not visible. To get an accurate measurement of the system performance, it is important to read only UV energy. It is possible for UV energy to be blocked, but visible light still to be present. Therefore, it is very important to monitor UV energy and not visible light. Many competitors claim to have UV monitors, but measure only visible light. 11. HOW DO I SIZE A UV SYSTEM TO MEET MY FLOW RATE REQUIREMENTS? 2. Open a single faucet completely and measure the time needed to fill one US gallon container (3.785 liters). The faucet should be as close as possible to the desired point of installation. 3. Divide the fill time into 60 to calculate the flow rate. Examples: If the fill time was 1 minute ( or 60 seconds), then 60 divided by 60 is 1, or 1 gallon per minute. If the fill time was 15 seconds, 60 divided by 15 is 4 or 4 gallons per minute. 12. IS THE UV MAX SYSTEM COMPATIBLE WITH MY CURRENT PLUMBING? UV MAX systems have a 3/4" inlet and outlet and are easily installed into residential plumbing systems. Most residential plumbing systems have 3/4" water lines. Some competitive units have smaller inlet and outlet openings that cause a water pressure loss and annoying water hammers. The 3/4" fittings on the UV MAX systems ensure these problems do not occur. 13. WHAT ARE THE ELECTRICAL REQUIREMENTS FOR THE SYSTEM? UV MAX systems use 25-67 watts of energy, similar to a 60 watt bulb. 14. SHOULD I SHUT OFF THE ULTRAVIOLET LIGHT SYSTEM WHEN I AM NOT USING WATER? NO!! Ultraviolet systems are designed to function continuously. If the system is turned off, it may be possible for bacteria and viruses to migrate through the water chamber and contaminate the distribution lines past the UV unit. 15. WHAT MAINTENANCE IS REQUIRED FOR A ULTRAVIOLET SYSTEM? To maintain proper disinfection, annual lamp replacement is required. After one year of operation the lamps ultraviolet energy is no longer capable of proper disinfection. Wipers are mechanisms used to clean the quartz sleeve without removing it from the chamber. Many inherent problems are associated with wipers. The wiping mechanism within the chamber causes shadowing and therefore allows bacteria to grow within the water chamber. Foreign material that builds up on the quartz sleeve is smeared, not removed, by the wiper. This smearing reduces the amount of UV energy available for UV disinfection. Any material that is removed from the lamp falls to the bottom of the water chamber and is flushed throughout your plumbing system. The UV MAX system maintenance is easy so there is no need for wipers. 17. WHO HAS THE BEST WARRANTY? All TROJAN UV MAX systems are covered by the most comprehensive warranty in the industry and is designed to protect the customer. Trojan UV models carry a five year warranty on structural, hardware and electrical systems. All lamps and UV probes are guaranteed for one full year. Some competitors' warranties may not even cover the lamp. NOTE: Commercial systems are available. Contact our office or e-mail us for selection and pricing regarding applications for: Dentists, Micro-Breweries, Restaurants, Water Sales, Ice Makers, Manufacturing, and much more. 1995-2019 Alpha Water Systems Inc.